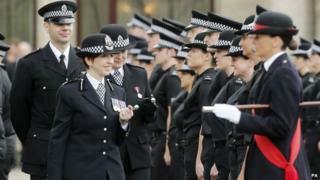 Graduates will not be fast-tracked into senior police roles without having worked "on the frontline", Scotland's justice secretary has said. Humza Yousaf told the Scottish Police Federation conference that the move would be wrong for Scottish community policing. Proposals in England and Wales could see graduates gain direct entry to inspector or superintendent ranks. Mr Yousaf also highlighted the 6.5% pay deal awarded to Scots officers. Addressing the conference for the first time as justice secretary, Mr Yousaf said: "Let me make it crystal clear, there will be no direct entrants under my watch. "I will not be supporting any proposal for direct entry to inspector or superintending ranks in Scotland, in the way which is proposed south of the border. "I believe that those who lead other officers must have spent time working on the frontline, to develop the knowledge of how we police our communities and understand the demanding jobs that our officers undertake day in and day out. "While training is of course important, officers must carry the authority and the respect of communities they serve, and also of their colleagues. "That is something built up as an organisation, as the sum of all its parts, and embodied in the actions of every officer as they go about their work." In his speech at Turnberry in South Ayrshire, Mr Yousaf spoke of the ongoing work of Scotland's health and justice collaboration board to ensure that police and health services work together. He told officers: "Of course police officers have an important role in improving people's safety and wellbeing. "But there's a clear need to improve how we support people in distress, and a collaborative approach focused on the needs of service users has been and continues to be a priority for myself and my ministerial colleagues."